Laremy Tunsil was a five-star recruit from Columbia HS in Lake City, Florida. Rivals ranked him as the number one offensive tackle and 14th overall prospect in the 2013 HS Class. He was recruited by Alabama, Florida State, and Georgia, but chose Ole Miss instead. Tunsil received All-SEC first team honors his sophomore and junior seasons as well as All-SEC second team his freshman year for only allowing two sacks in 28 career starts. To end a great career at Ole Miss, he even ran a touchdown in on a designed lateral versus Oklahoma State in the Sugar Bowl. He enters the 2016 NFL Draft as the consensus best offensive tackle. Quick feet to set after the snap dropping hips and getting hands ready to jab. Keeps arms and knees bent when engaging with the defender. Uses arm extension and length to recoil pass rushers. Very rarely his body. Stays on his toes and doesn’t drop his head upon contact. Smooth athlete who quickly accelarates into next level. Maintains good leverage throughout most run blocks unless the pass rusher uses length expertly. Great at throwing cut blocks. Drive blocks on defensive lineman need more lower body strength to sustain. Powerful left arm to nullify outside pass rushers (as a left tackle). Very patient pass blocker. Doesn’t jab too early, waits for pass rusher. In run defense after initial contact and a defender disengages, he doesn’t chase and finish the block. Will help finish the block on a new target nearby though (especially moving piles). Never played a full season at Ole Miss. Always seems to be injured or recovering from injury. Missed 7 games due to NCAA suspension (impermissible benefits). Inconsistent at sustaining blocks in run game. Proportional frame, but needs to gain more lower body strength for drive blocks. Whistled for multiple false starts in order to anticipate the snap against Auburn’s speed rushers. A good outside fake with speed can sometimes expose him to an inside move. Excellent fit for zone blocking scheme. Can fit power concepts, too. For fun, let’s start with the touchdown I mentioned in the intro section: His lateral toss in the blow out versus Oklahoma State in the Sugar Bowl. Note: This is completely legal since it’s a lateral and not a forward pass. Just unusual! Not many offensive tackles get a designed play for them… Unless, of course, you are Bill Bob from Varsity Blues. Let’s begin the real film! Laremy Tunsil quickly sets off the line of scrimmage and uses a powerful left jab to control pass rushers off the edge. He did an excellent job of controlling Texas A&M’s Myles Garrett and Oklahoma State’s Emmanuel Ogbah. Garrett should be a first or second round pick in the following draft, while Ogbah should be a second round pick this draft. Patience is a key trait for pass blockers in the NFL. Laremy Tunsil is the model example for this waiting for the pass rusher to come to him and not reach. There are times when the pass rusher initiates contact, and Tunsil is a little less patient on his second jab. But these situations are far less frequent as Tunsil typically does a good job of controlling his defender after initial contact. Tunsil is an elite pass blocker, and the only area I can see him struggle with at first as he adjusts to the pro game is with speed blockers on the edge. Rushing to the edge widens his hips enough for an inside move. 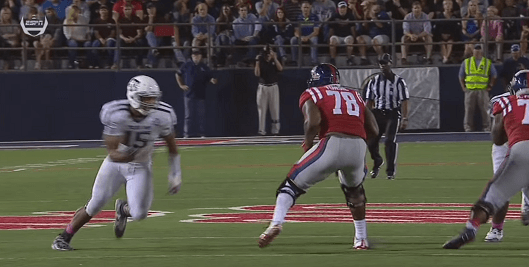 Using a combination of speed and power, an edge defender can get into his chest plate to off balance Tunsil. Versus Auburn he was called for multiple false start penalties attempting to anticipate the snap and reaction by the edge rusher. Interesting enough, many project the Chargers at #3 to select him and he would have to face the best speed rusher in the game with Von Miller. Here’s a film breakdown I wrote about his speed rush during the last Super Bowl. Article continues on the next page looking at his run blocking abilities.